Usually when super hero franchises approach their 3rd or 4th film they start to grow somewhat stale. This isn't the case with the Iron Man series although the previous director of the other two parts Jon Favreau has this time decide to step away from the director's chair and gives the reigns to Shane Black (Who only directed Kiss Kiss Bang Bang before but who is a successful screenwriter ) Black gives us a better sequel then Favreau himself did with Iron Man 2 with all the things that made the original Iron Man great high flying action...explosions (Tony Stark's beautiful Malibu home hanging over the bluffs goes bye bye in this) A menacing villain as in The Mandarin. Storyline this time around goes as follows; After returning home from once again saving the world it's not long before our hero Tony Stark aka. Iron Man watches the news and sees their is yet another villain lurking about this time in the form of The Mandarin (Ben Kingsley) after Stark literally threatens The Mandarin and gives him his home address(Something I thought was incredibly stupid) saying that he now knows where to find Stark it's not long before Mandarin unleashes an attack on his home putting both Stark and his girlfriend/CEO of Stark Enterprises Pepper Pots (Gwyneth Paltrow) in jeopardy . After the attack Stark states to Pepper he must protect the person who he cares about the most and that is her and go head to head with this guy. The movie brings out some cool aspects such as Iron Man's sidekick Rhodey (Don Cheadle) who is now donning a US Flag colored version of the Iron Man armor and is now being called The Iron Patriot. 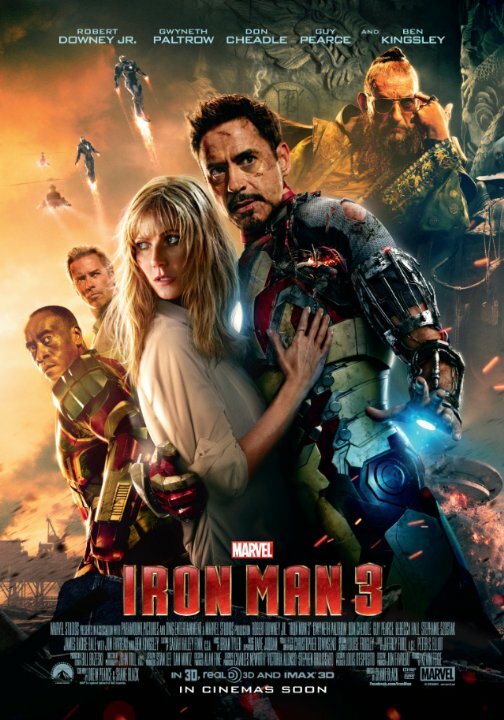 Also Stark is working with all his various Iron Man armored suits to have a mind of their own in a robotic sense something without me issuing any spoilers leads to a fantastic climax in this film.